New technology stabilises the circadian rhythm of intensive care heart patients at Copenhagen University Hospital. The cardiological intensive care unit is focused on new technological initiatives that support and optimise treatment. 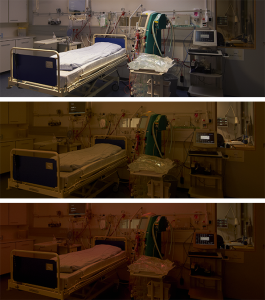 One of them is Chroma Zenit Circadian Lighting, which improves the conditions for patients as well as staff. The driving force behind the new light in the cardiological intensive care unit is the charge nurse Charlotte Illum, who is happy to use new technology if it contributes to improvement of the patient care. ”I saw Chroma Zenit Circadian Lighting being used in the neuro intensive care unit at Aarhus University Hospital a couple of years ago. After that, I signed up for a theme day on innovation, where we were presented with a complete sensory stimulation concept, CURAVIVO, which consists of Chroma Zenit Circadian Lighting, noise masking/ music intervention, visual observation and info monitors. Later, we were given the opportunity of establishing Chroma Zenit Circadian Lighting at nine beds as well as in the nurses’ office. We have now had Chroma Zenit Circadian Lighting for a year. The light is adapted to the patients’ circadian rhythm and the unit’s work routines and work hours – and this makes a great difference in our daily lives”. Chroma Zenit Circadian Lighting is preprogrammed to follow the rhythm of the sun during the day – and provide protective night light. The light starts up nice and easy in the morning and wakes the patients with a natural sunrise. The unit has three rooms with two beds each and one room with three beds with Chroma Zenit Circadian Lighting – and there is an individual installation over each bed. ”With the zoned light, we can keep the room dark at night and only turn on light around a single bed in an emergency situation”, says Charlotte Illum. The staff has taken Chroma Zenit Circadian Lighting to heart, even though, according to Charlotte Illum, there has been some scepticism, because Circadian Lighting must be used in a completely new way. ”Chroma Zenit Circadian Lighting is preprogrammed and changes automatically over the day and night. It is a challenge to keep the staff from changing the light. After all, they are used to controlling the light as needed”.